My Tribute to Michelle Obama...Happy Birthday Madam First Lady!! Posted By:@AVGJOhanna | At:10:40 AM Be the first to comment! After reading Essence magazine's special edition tribute to the First Lady of the United States, Michelle Obama, as she turns 50 years of age, I decided to write my own tribute to Mrs. Obama. Normally, I am not one that is starstruck and until the Obamas came along, I cannot say that there was anyone on this earth that I was just dying to meet. So the idea of me taking the time to write a tribute to any public figure means that I truly find that person to be both admirable and remarkable. While I still cannot say that I am dying to meet our First Lady, I most certainly would like to meet her and get to know her personally. To be quite honest, I have literally dreamed that I not only met her but I actually worked with her. Time will tell whether or not that dream will come true. So yes, along with countless others, I admire the historic First Lady of the United States. Though I tend to think that my admiration stems from a different vantage point than the more popular reasons why people love her. Those more popular reasons include her sheer status as First Lady of the United States, her fashion sense, her Ivy League education including Harvard Law School, her work with military families and childhood obesity, her role as mom-in-chief to her daughters and her strong marriage to our President. Taking into account her racial identity, she is admired for redefining the image of black women in the United States and around the world. She has shown the world that black love is real and beautiful and that black mothers are just as devoted to their children as any mother. While I admire her for these reasons, I admire her most for just being her. Her authenticity is what stands out to me. Being herself proved to be enough to propel her to greatness. While she may have had to make an adjustment to the constant spotlight, she figured it out; made it her own; and in my opinion, broke the mold. Her authenticity says to me that I can be my authentic self and excel as well. Excel not at emulating her but excel at being me. Not that she is not one to emulate. Quite the contrary. In fact, one may think I am trying to emulate her as our lives parallel in a number of ways. We both grew up in the inner city; Mrs. Obama, the south side of Chicago and me, right next door in Gary, Indiana. We both excelled in school and went on to earn advanced degrees. We both left what many consider prestigious positions with pretty nice salaries (Mrs. Obama, a lawyer and me, an engineer) to work in higher education student affairs. When I found myself eying a student affairs position at the University of Chicago not too long ago, I thought to myself that I was tapping into "my inner Michelle." We both try to lead healthy and balanced lives. And we both like to show our "homegirl" nature. I get a kick out of watching her jump hopscotch and double-dutch. When she ended her "mom dance" with Jimmy Fallon having fun dancing the dougie, I thought, "that is so me!" When she shocked the world with her bangs, I was reminded that I liked bangs and got my hair cut not long after her bangs debut. In many ways, I am Michelle Obama and Michelle Obama is me and because she excels at being her, I can excel at being me. Lastly, I remember in my twenties telling a friend that I did not want to be 50 and just figuring out this thing called life. While I respect the notion, "better late than never," I prefer "the sooner, the better." 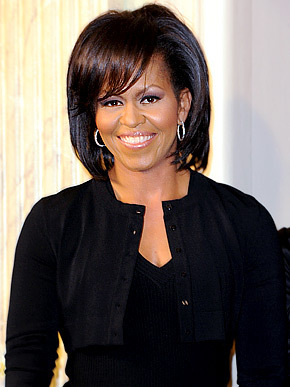 Clearly this is the way of our First Lady, Michelle Obama, as she is just turning 50 today and her life thus far indicates that she figured out some key principles of living early on such that being 50 and fabulous is not a revelation because she has been authentically fabulous long before.